Dr. Kaushik Majumdar being inducted as Fellow of the Indian Society of Soil Science by Mr. Om Prakash Kohli, Governor of Gujarat. 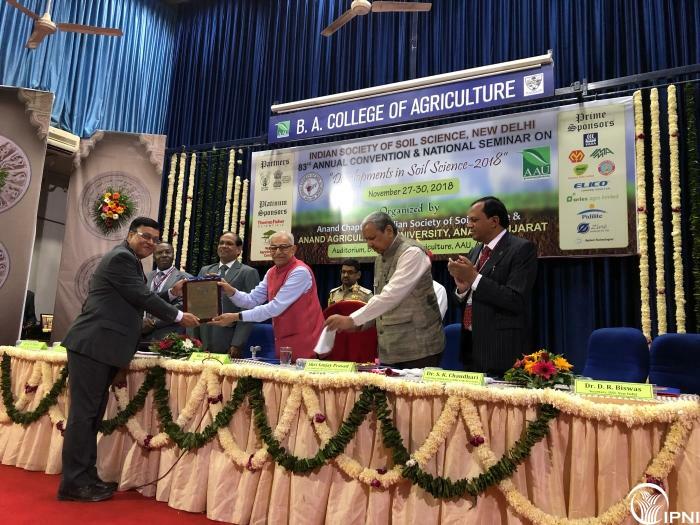 The award was presented by His Excellency the Governor of Gujarat and former member of Rajya Sabha, Mr. Om Prakash Kohli at the 83rd Annual Convention of the Indian Society of Soil Science held at Anand Agricultural University, Gujarat on November 27, 2018. Mr. Sanjay Prasad, Additional Chief Secretary of Government of Gujarat; Dr. N.C. Patel, Vice Chancellor of Anand Agricultural University; and more than 300 eminent soil scientists of the country attended this event. This is the first time in the 83 year history of the society that a member from an international organization supported by the fertilizer industry was conferred with the award. “It is a proud moment for the IPNI South Asia program as the award is a recognition of the scientific leadership offered by IPNI in the region towards promoting improved plant nutrition,” said Drs. T. Satyanarayana, IPNI South Asia program director, and Sudarshan Dutta, deputy director.